On Wednesday morning, my friend Jan invited me out for a "social ride." Knowing Jan, it seemed likely this nice, easy ride would include at least 5,000 feet of climbing, so I showed up prepared with a few energy bars. 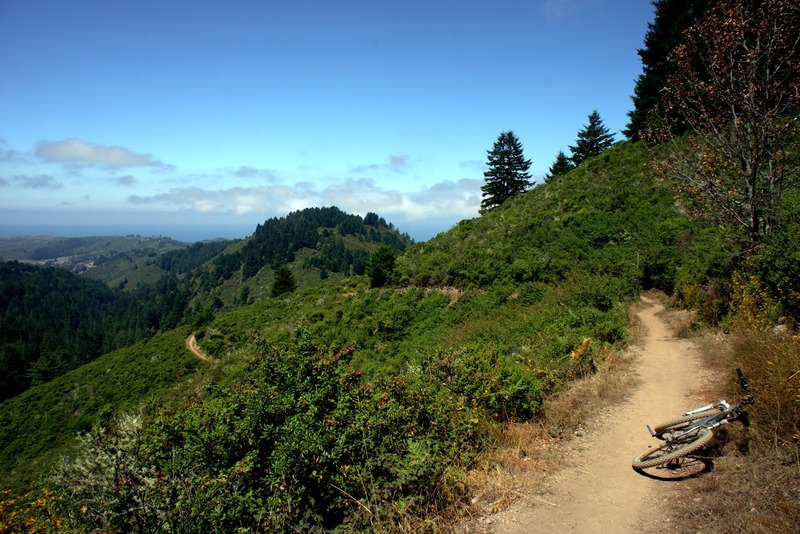 We set out from Woodside to ride new-to-me trails in Purisima Creek Redwoods. I love the simple surprises afforded by exploring new places. Even though I've lived in the Bay area for more than a year, there are still large tracts of open space within a twenty-mile radius that I have yet to see. Each new discovery continues to surprise me, both in the reminder that I'm far behind the curve in my hometown explorations, and the fact that there is so much scenic park land within spitting distance of a population center of seven million people. Jan is currently searching for a new job in the biotechnology sector, which has been a source of both frustration (that he seems to vent by going for awesomely tough bike rides) and inspiration. As we discussed some of his intriguing ideas for start-ups, I realized that Jan was among my growing list of biking and running friends who work in compelling and complicated professions — I would categorize their work as "stuff I'd really need to read several books about first before I feel comfortable asking questions." There's Daniel in Frisco, whose start-up company aims to draw patterns from the wild chaos of human behavior through tracking technology. And of course I have Beat, the theoretical physicist who just spent the evening soldering tiny parts on a circuit board for the electronics of a prototype device for his friend's start-up company. These days I seem to frequently meet brilliant people, and the reason I'm even on the periphery of their world is because I like to ride and run long distances. I have been mulling my own career path recently and wondering if I'm on the right track. I have no doubt in my mind that I want to be a journalist, which is another way of saying I want to observe life and tell stories. If Jan ever does discover a hormone that he can turn into an anti-obesity miracle drug, I'd honestly rather write his biography than serve a research role and rake in a piece of the billions (okay, maybe that's not true about the billions.) But the point is, I am secure in what I want to be. I'm just not sure whether I'm on the right path to make it happen — not only from a financially viable standpoint, but also in regard to my ongoing struggles to be the prolific producer I know I can be. Do I ride and run too much? Do I spend too much creative and intellectual capital on my adventure scheming and this blog? Am I more afraid of failure, or possibly success? I admit spending time with my brilliant friends sometimes leads to me feeling some professional guilt. The fact they create what they do while avidly pursuing their outdoor passions means I should be able to do the same. But right now I'm still in my "deciding" phase. I guess this blog post is really just another part in my recent "Why is Jill feeling so insecure this month?" series. It feels good to air them out. But Jan and I had a great ride today. We wended through the redwood forest and a tight ribbon of singletrack and emerged on a grassy hillside, dropped to the coast on a farm road and then climbed again. There were more downs and ups, 37 miles and 6,200 feet of climbing. Just an easy social ride. It is almost unfathomable to me that you could ever feel insecure about your writing. I suppose much of that insecurity comes not from any doubts about your talent or ability, because you are clearly talented and so much more than able, but from that small bit of gray matter in the creative centers of the brain that seems to both bless and curse all creative people. Blessed with the talent and ability to write or paint or sculpt and then just as equally cursed with the bane of the emotional highs and lows of simple (or in your case, extreme) existence. Creative people sometimes need a little confirmation and encouragement. Consider this as such. If it is a journalist you strive to be than you will be a great one. In fact, I believe you already are. Just a note to encourage you to continue to pursue the 'writer' path. I started reading your blog to vicariously enjoy your adventures. I still do that, but now I'm just as intrigued by the quality of your writing. ...oh, your photos are good too. Your writing is top notch...mostly because it is bold, naked, and from the heart. Don't ever doubt your choice of profession...to put it simply, you are doing it right. Never get caught up in the trap that you need to "produce" more..especially if you include the trap of comparing yourself to others and what they do. You have to be you, and you experiences outdoors are part of who you are, what you do, and what you write...so scaling that back would just end up putting you in a place with the wrong perspective. This ride looks like a lot of fun...lots of climbing as well. 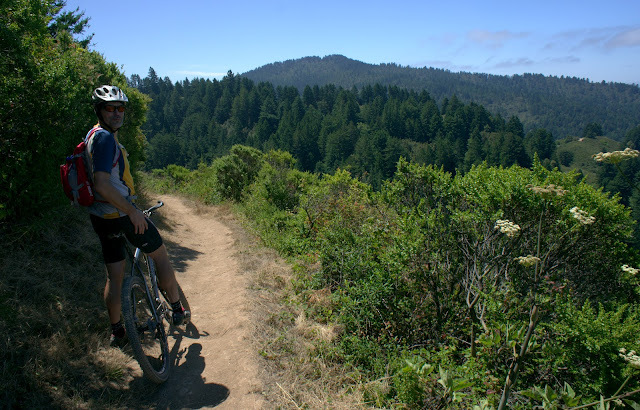 Purisima Creek open space preserve is one of my favorite places to ride when I am down in Half Moon Bay. Took my daughter to ride Whittemore Gulch a few months ago and now she cannot wait to get back to that trail. Question on the section of your ride that went through Huddart County Park: I was under the impression the trails in that park were off-limits to bikes (park regs state pavement only)...I would love to find a mostly dirt route that goes over the ridge between HMB and San Carlos/Redwood City/Belmont area. If it makes you feel any better about your current path, I'm sure I'm not the only one who will admit that reading your blog is a wonderful break from my amazingly repetitive desk job. I'd hate to see you sitting where I am now and if I could write like you do I'd switch places in a heartbeat. But I can't, so you'd better keep it up. A view from inside research...the creative and intellectual capital is not always the product of the person taking/receiving the credit. I've read your books and enjoy this blogsite, your writing is great but I sense you have a need to expand. Cycling has a huge history world wide but most of the writers are dry, probably because few actually ride the tough stuff. Biographies of famous and unknown riders of the perfect machine may be a good research topic. As far as the anti-obestiy drug, just drop the sugar fix...I know quick energy on rides but maybe you could reduce the gummy bears for a better balance for endurance. You may have Allen Lim's book, The Feed Zone, if not...check it out. There are some recipes you can prepare ahead and take with you on rides. You are so fortunate to know what career you desire and that its something you're great at--writing. I know this may sound simple, but I've known so many people who are in careers they don't desire or careers that require skills they are not good at. It hurts them, their coworkers, and the employer. While you may not be at the point in your career that you want to be, at least you have great ingredients to achieve what you're seeking. as i sit here with redundancy looming very soon, I often question whether i chose the right career path, and why I am a 'failure'. But then I remind myself that I enjoy what I do, it allows me time to enjoy being with my family and following my pursuits. We can't all be Type AAA personalities, otherwise the world would not work. As was once said, "don't chase happiness, just be happy".